A giant African Rock Python was suspected of eating a calf and killing livestock in the area, so Nigerian locals made the decision to capture and kill the snake, hoping to stop the snake from consuming more of their valuable animals, as the snake was swollen and about one foot wide and ten feet long. But what they discovered, was quite the opposite.The python, which is considered one of the largest snakes in the world, was filled with a dozen eggs. While the locals were in shock by the surprise eggs, they were excited about the rare delicacy that they discovered and proceeded to eat. Some of these snakes are known to produce 100 eggs at one time. Instead of feeling sympathy for the mama snake that they killed, the Nigerian locals were pleased that they captured and killed the snake before she birthed more of the species. While the African Rock Python is not a venomous snake, it uses constriction, asphyxiation and crushing to capture and kill their prey. And if you aren’t convinced that the locals made the right decision to kill this snake, then you might be when you hear about a case that dates back to the 1950s when a human infant and an animal were allegedly found inside a 23-foot python. This large species usually sticks to consuming rodents, warthogs, antelopes, monkeys, fruit bats, crocodiles and monitor lizards but every now and then they take down larger animals and even humans. 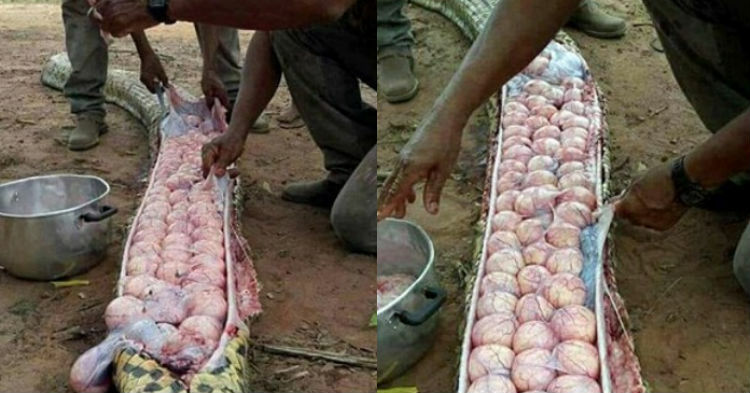 They’ve been known to eat lion, leopard and cheetah cubs.Before being slaughtered in Malaysia in April, the longest ever captured python measuring at 26 feet long and 550 pounds laid a massive amount of eggs. It was surprisingly discovered on a construction site underneath a tree and a team of civil defense officers came out to capture it.Evidently, the stress of being captured caused the snake to lay the eggs early and right before she was slaughtered the eggs made an appearance. We can only assume that those eggs were eaten by the locals as well, as they are considered a delicacy.The African rock python is found in a variety of habitats, from forests to deserts, although they most often frequent areas surrounded by sources of water. Unlike most snakes, the African rock python female sticks around and protects her nest and sometimes even her hatchlings.